But rather than this endless search for a brilliant and novel solution, why don't you just copy something that’s worked before? 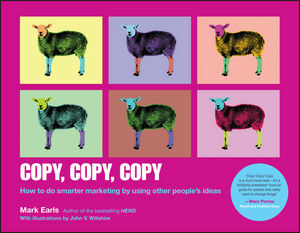 Mark Earls, leading expert in marketing and consumer behaviour, quashes the stigma around copying, and shows that it can help us to rethink how we go about solving problems. By understanding what other people are doing and the choices they make, we can develop strategies to solve the challenges that we face inside and outside the organization. Based on extensive research and proven examples, Copy, Copy, Copy provides over 50 strategies that you can use right away to copy, borrow or steal as the basis for better ideas – faster. If it’s good enough for Elvis, Newton, Shakespeare, The British Olympic Cycling Team and Great Ormond Street Hospital, isn’t it good enough for you?